Picnic Table Mounting Style Guide - Picnic Table Store-Commercial grade quality-lowest price. 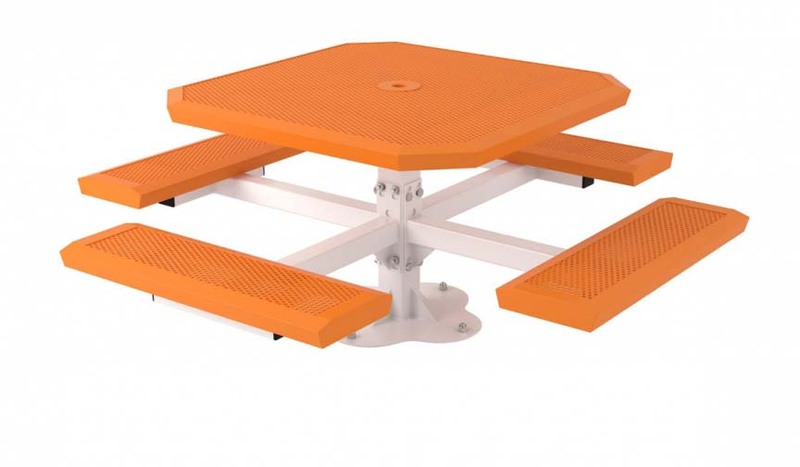 Picnic Table Supplier has the largest selections of picnic tables online! With so many options, we understand that it may be confusing. To ensure that you order the correct picnic table and bench for your project, we have provided this guide to give a thorough definition of the difference between in-ground, surface mount, portable, and portable/surface mount picnic tables. See our Buyers Resources page for more information on choosing the right picnic table for your commercial venue. 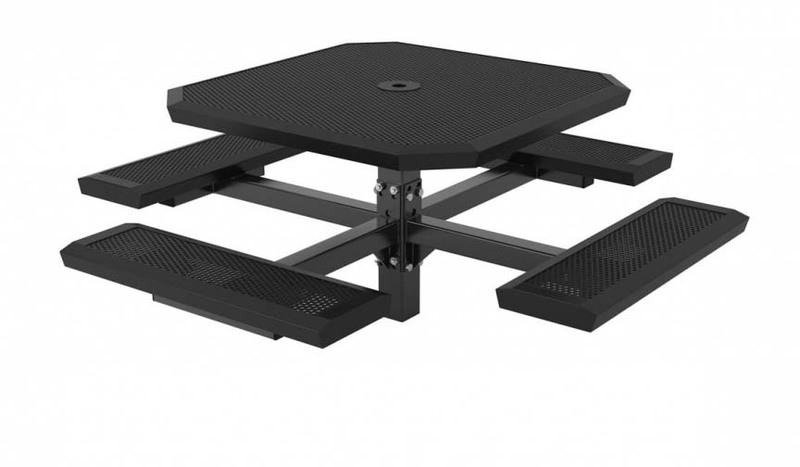 Rests on solid and level surface such as grass, concrete, or asphalt. Install on existing solid surface such as concrete or asphalt. Portable with optional surface mounting holes. Install on existing solid surface (concrete/asphalt) or rests on existing solid level surface. Install below ground in dirt, grass, or fresh concrete. Portable Picnic Tables can be picked up and relocated. installation, can be relocated with unassembly. Semi-Permanent installation, can be relocated with unassembly if surface mounted. Best option for theft prevention. Can not be moved once installed. A portable picnic table frame is ideal if you do not have a place to permanently install the picnic table. Portable frame are a non-permanent solution, making it possible to move the picnic table. Portable frames can sit on a flat surface without anchoring. Some of our portable mounted picnic tables may have surface mount holes in the frame. Portable picnic tables have the easiest installation. Surface mounting is a semi-permanent solution. If you would like the possibility of moving your picnic table, however, vandalism is a concern - than surface mounted frames are ideal. Surface mounting is great if your picnic table will be going onto a concrete surface. Some of our picnic tables require a steel plate to be bolted onto a concrete or asphalt surface. Surface mount fixtures have holes in the legs for bolts to be inserted into anchors embedded in concrete. When installing, holes must be drilled into existing concrete surfaces to embed anchors. 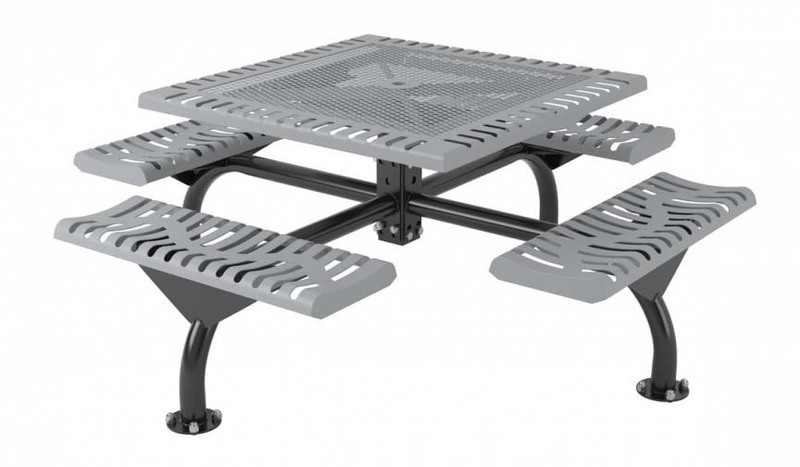 See our category for vandal resistant picnic tables to find picnic tables with surface mount or inground frames. In-Ground mounting is a permanent solution for areas where vandalism is a concern. In-ground mounts are used in grassy areas or are prepared to be put in a concrete pad. The installment for an in-ground mount may require the post to be set into an approximately 18" concrete poured hole. Some Picnic Table frames include "J-Rods" to be inserted through the surface mount holes on a piece of furniture. The bottom of the J-Rod is then embedded in a hole filled with concrete. 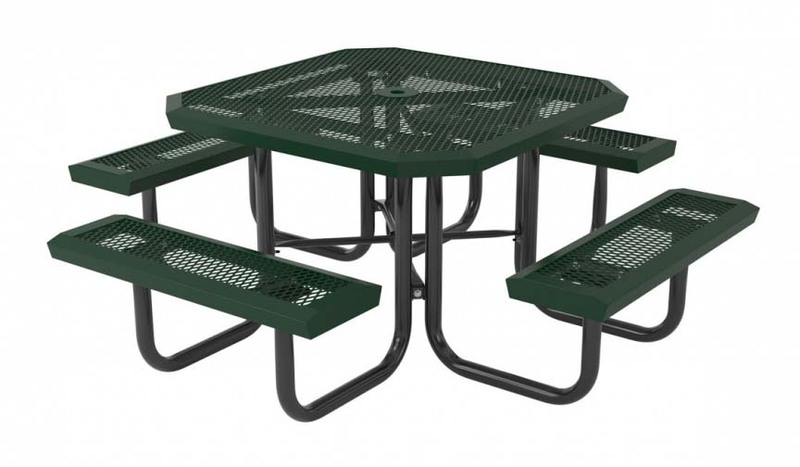 See our category for vandal resistant picnic tables to find picnic tables with surface mount or inground frames.